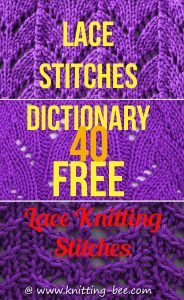 Knitting Bee’s Lace Stitches Dictionary. 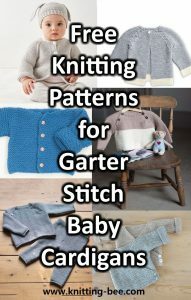 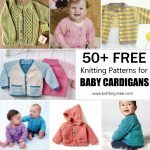 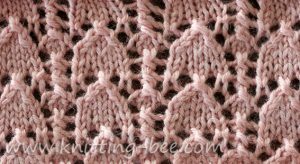 An all free resource for lace stitches with many original lace stitch design by Knitting Bee! 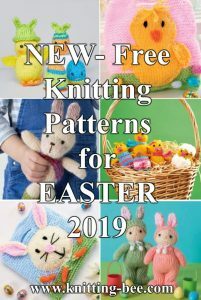 The lace stitches dictionary below features a list of our best free lace knitting stitches starting with our most popular stitches! 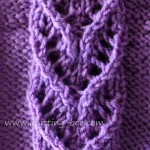 Click on the title of the desired stitch to get the free lace stitch pattern in written format. 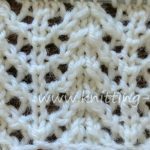 A traditional lace knitting stitch that is easy and fun to knit up, perfect for shawls and other lacy items! 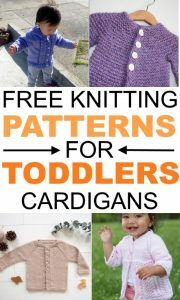 Set over a four row repeat. 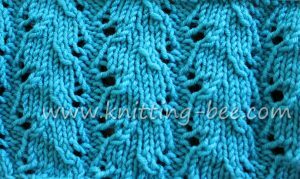 Simple lace stitch knitting pattern worked over a four row repeat. 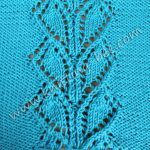 A gorgeous lace that originates from the Shetland Islands in the nineteenth century, when gossamer lace was in fashion. 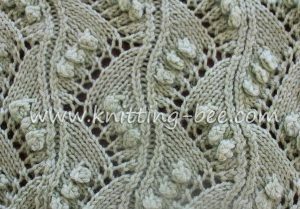 Lace knitting panel featuring a grouping of four leaves. 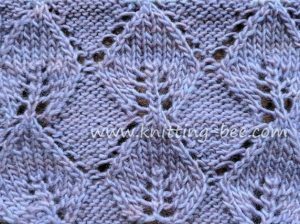 Delicate lace in a braided pattern. 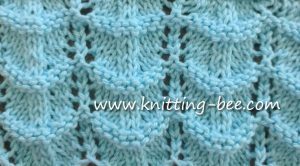 An easy to follow, popular ripple stitch to knit that is very delicate and pretty! 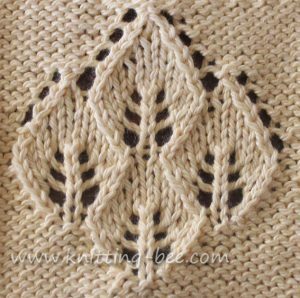 Pretty and very popular lace stitch pattern made up of leaves that trail into one another. 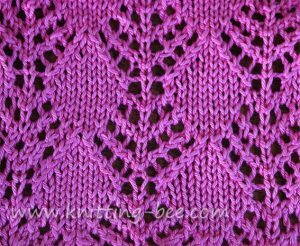 Lace leaf stitch on a reverse stockinette base. 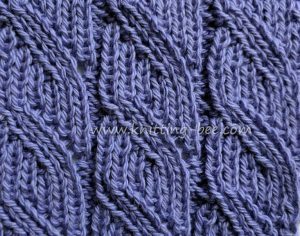 Mock cable stitch, the illusion of cables without the bumps. 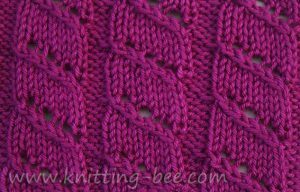 A fun lace and bobble knitting stitch within a wide rib. 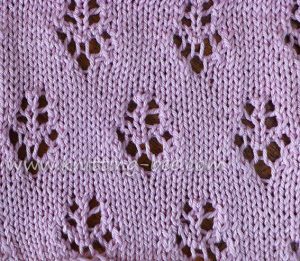 Lace eyelet panels placed vertically and adorned with pretty sets of bobbles. 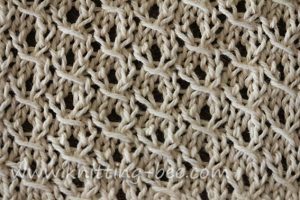 Simple and easy chevron lace knitting stitch. 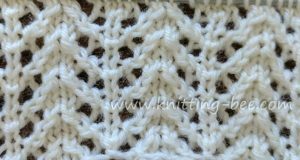 Little knitted lace heart you could include into scarves, sweaters, blankets and any knitting project of your choosing. 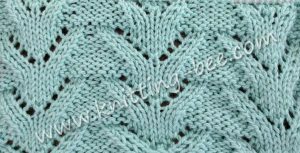 Gorgeous lacy leaves knit stitch pattern. 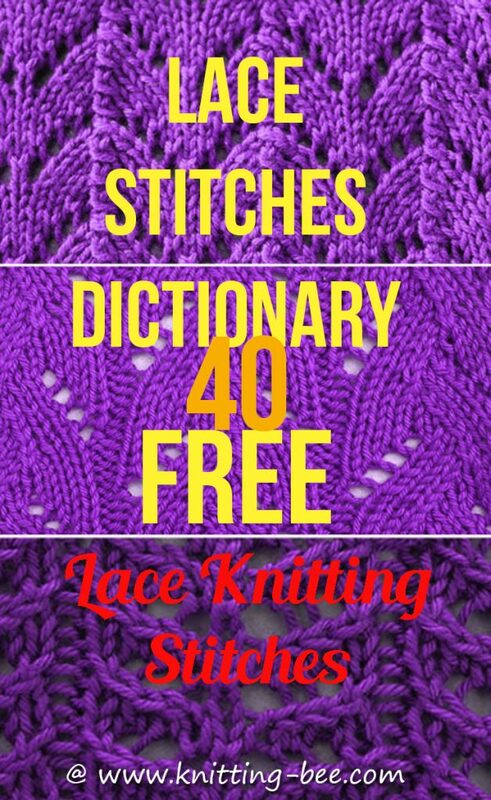 A classic stitch that is a must have for a lace stitches dictionary. 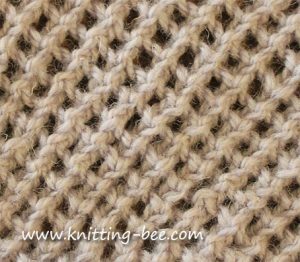 A delicate and ornate twist on the common knitted rib, by adding eyelets on either side, something much more interesting is created while still maintaining that elasticity that’s needed when using ribbed stitches. 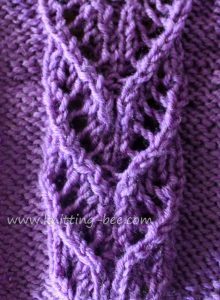 The eyelet filled chevron is also a rib making it very elastic. 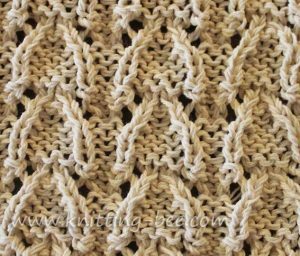 Easy lace stitch set over a four row repeat. 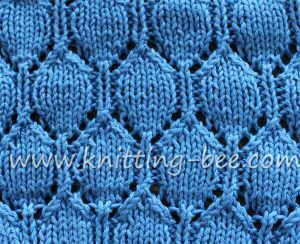 Create ocean like waves extending upwards in vertical panels with eyelets in between. 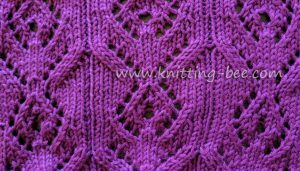 This is a great beginner lace pattern as it utilizes basic stitches, knit, purl, yarn over and knit two together. 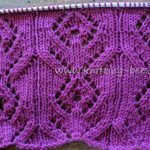 A heart vine panel set against a backdrop of reverse stockinette stitch. 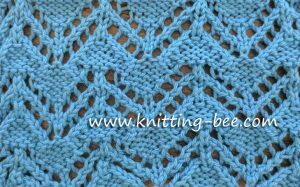 Lace panel with a pyramid shape. 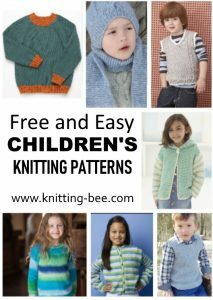 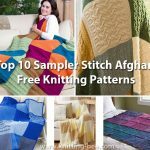 Fun to create and free knitting stitch featuring small diamond shapes. 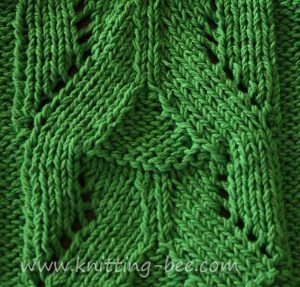 A simple lace knitting stitch with a pattern that looks like triangular stacked columns. 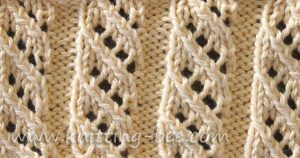 Chevron pattern lace knitting stitch! 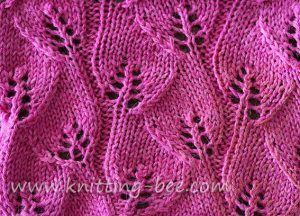 Diamond shaped trees free lace knitting stitch. 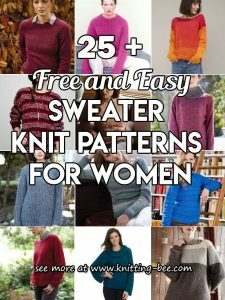 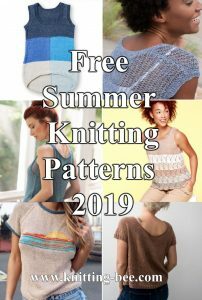 Free lace knitting stitch featuring oval shapes stacked on top of each other in a honeycomb style. 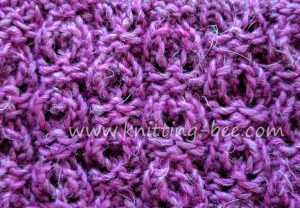 A feminine lace stitch to knit that is very simple to create using easy decreases of k2tog (right slanting decrease) and ssk (left slanting decrease). 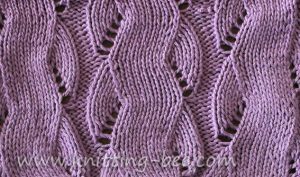 Free oblique openwork rib stitch knitting pattern. 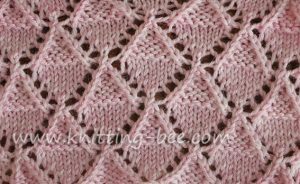 Lace knitting stitch featuring diamond shapes. 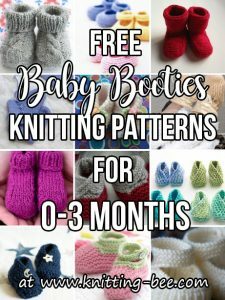 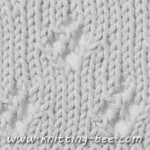 The best feature of this free knitting stitch is that the diamond is divided into two with the bottom half in stockinette stitch and the top half in garter stitch. 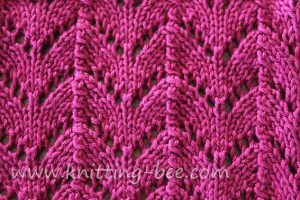 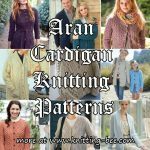 Stretchy lace and rib knitting stitch that is reversible! 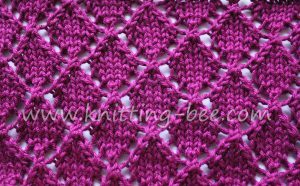 A rib stitch pattern with diagonal strands of openwork. 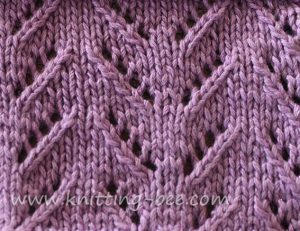 A lace stitch pattern with super-imposed arches. 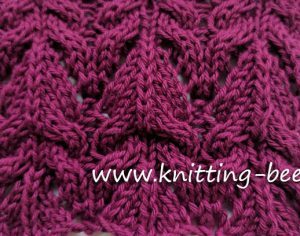 Free lace knitting stitch pattern with a diamond shape with a pattern that looks a bit like a flower. 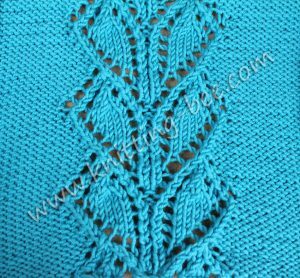 Stretch mesh knitting stitch, this stitch has a stocking like effect, it is very versatile for garments that need give. 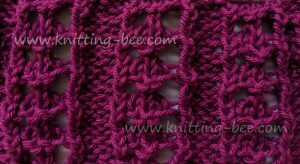 A eyelet/lace rib set over 4 easy rows. 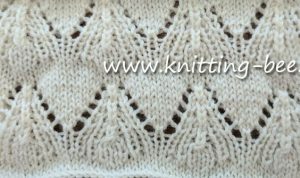 Lace knitting stitch with rows of vaulted arches. 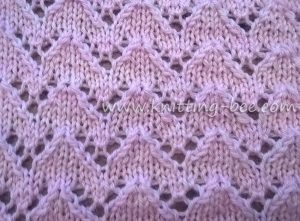 A horizontal lace chevron knit stitch. 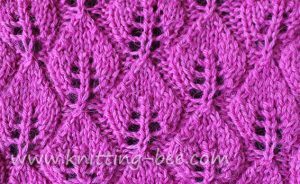 A lace knitting stitch with the shape of a dewdrop! 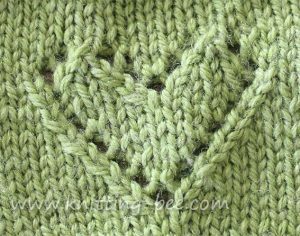 Cute knit stitch in the shape of gnome hats! 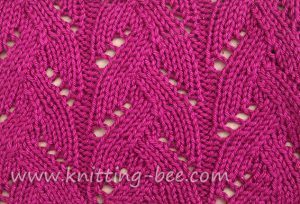 Intricate lace panel with a heart motif. 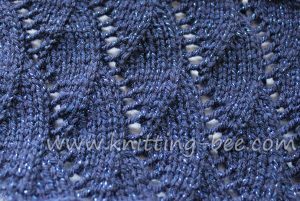 A stitch that combines lace and cable.